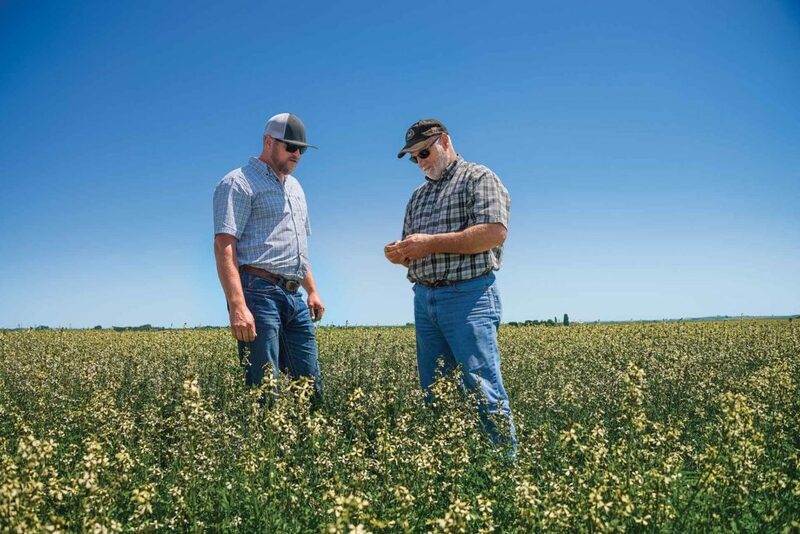 Dale Gies and his son Joe have a hot solution to big challenges facing potato and vegetable producers around the world—they use spicy Oriental mustard varieties to control nematodes and pathogens while building up soil organic matter. When Dale started farming near Moses Lake, Washington, in 1981, the land his father had busted out of sagebrush almost 30 years earlier was in a tailspin. Organic matter was falling, topsoil was blowing, water wasn’t infiltrating, and nematodes and pathogens were eating away at yields. The Gieses struggled to find cover crops that could build soil organic matter without also building populations of nematodes and pathogens. Gas attack. Nematodes are a huge problem for potato growers—just 3 percent damage by the Columbia root-knot nematode (M. chitwoodii) can cost a processing potato grower his contract. Potatoes are also sensitive to a wide range of nematodes and diseases, so broad-spectrum soil fumigation with metam sodium (Vapam) and Telone is standard practice. The Gieses came across research by the Centro di Riserca per le Colture Industriali (CREA) in Bologna, Italy, where government scientists were studying biofumigants—natural gases produced by mustards and other brassicas that are toxic to pathogens. It’s the same reaction that makes mustard taste spicy. When you chew a mustard seed, a chemical in the glucosinolate family is released. So is an enzyme called myrosinase. When the two ingredients meet in the presence of water, myrosinase breaks down the glucosinolate molecule to form a gas called alleyl-isothiocyanate (AITC)—the spicy substance that makes your eyes water and sinuses burn. Joe and Dale Gies examine arugula, which attracts nematodes to boost biofumigation’s effects. There are more than 140 known glucosinolates, and some are much more effective soil fumigants than others. The Italian researchers recognized that not all mustards contain the same glucosinolates, nor do they store the compounds in the same plant tissues. Targeting sinagrin. The scientists zeroed in on one particular glucosinolate, sinagrin, that was particularly effective at controlling nematodes and diseases. Then they identified several fast-establishing varieties of Oriental spicy mustard (Brassica juncea) whose soft seeds were less likely to create weed problems in subsequent growing seasons, and that produced high levels of sinagrin in their leaves. The Gieses had found what they were looking for. In fact, they were so enthusiastic, they established a company called High Performance Seeds and convinced CREA to license them the rights to grow and sell the center’s B. juncea varieties, a business that has grown to cover sales in 25 countries. Working with agronomist Andy McGuire of Washington State University Extension in Moses Lake, the Gieses compared dozens of mustard and arugula varieties in replicated trials on their farm and found they could maintain potato yields without Vapam following fall crops of Oriental mustards. McGuire notes that levels of AITC released in the soil by Oriental mustards are not close to the levels of MITC applied as commercial fumigant—so there are unknown factors in play. Big results. Don Gillespie of Warden, Washington, tried Oriental mustard around 2011 after he found hotspots of 30,000 M. chitwoodii in a recently purchased field. He became a believer in the program, which he says costs an average of about $80 an acre. Cut rates. Such huge reductions in nematodes could revolutionize potato production, where growers face growing pressure to reduce chemical use. WSU’s McGuire notes that biofumigants could enhance conventional programs, and might even allow growers to reduce their fumigant rates. He emphasizes that biofumigants require the same attention to detail as conventional fumigants do. That includes seeding in August—which allows about 80 days of growth before incorporation—applying 100 to 120 pounds of nitrogen per acre plus sulfur, irrigating adequately to maximize biomass production, and following a flail chopper immediately with a shallow disking into moist soil. Life-changing catastrophes don’t all happen in the blink of an eye.